Accuweigh’s Melbourne branch recently added another weighbridge deck to a clients existing weighbridge to eliminate the need for split weighing long trucks. Split weighing is done when the length of the truck and trailer exceeds the length of the weighbridge; requiring the combo to be weighed in two sections – the truck first and then the trailer. 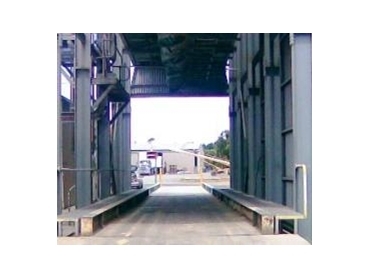 Split weighing accuracy is highly dependent on the length and level of the approaches at both ends of the weighbridge. Split weighing is usually no longer permitted on public weighbridges due to the potential in-accuracies that can occur. Heytesbury Stockfeeds is a stockfeeds manufacturer on the Victorian Central Coast and required a solution to eliminate the need for split weighing and to weigh B Doubles in a single weighing transaction using their existing 18 metre weighbridge. Accuweigh‘s response was to graft another weighbridge onto Heytesbury’s exiting weighbridge for an overall weighbridge length of 36 metres. The combination dual deck weighbridge uses 3 x Rinstrum R420 digital weighing indicators to provide the individual weight indication for each weighbridge as well as perform the vital summing duties for the total weight on the split deck weighbridge. The new 18 metre weighbridge was installed and commissioned for during the Xmas break so as not to hinder the company’s busy production schedules. Accuweigh is an Australian industrial weighing company and has branches in all mainland states providing complete after sales service and support on all types of weighbridges and weighing equipment.